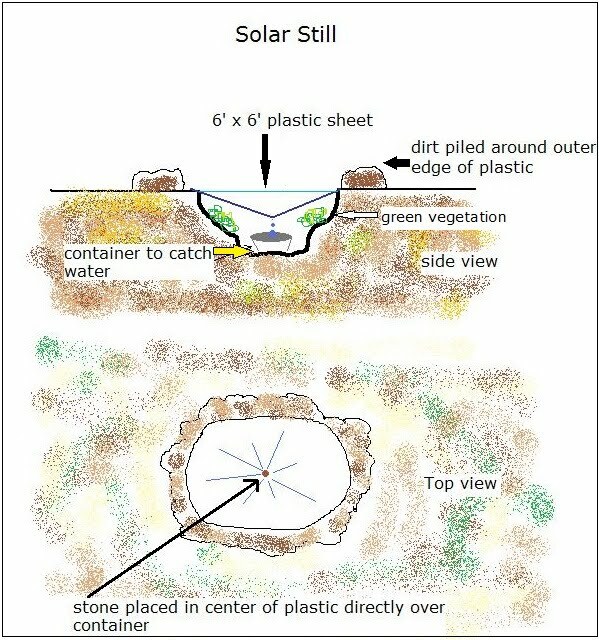 Before deciding to construct a solar still, you must understand that it takes approximately 45 minutes to construct one, which can zap a lot of calories and moisture in the process. If you plan on staying in one place for a day or two in hopes that rescue is on the way, then building solar stills may be a viable solution if you are hurting on water resources. The location you decide to construct a still should be in the open in a sunny location. The ground should be soft for digging and should contain moisture or moisture was present at some point in time. A good area would be in a dry river bed. 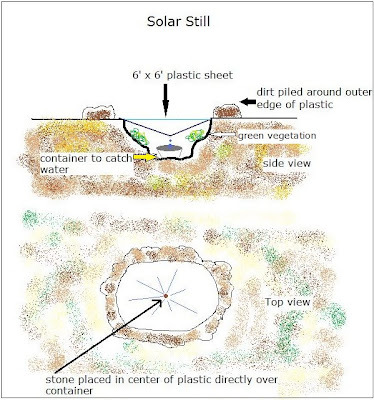 Construction Steps: (each solar still requires approximately a 6' x 6' sheet of plastic (clear plastic works better). 1. Dig a bowl-shaped hole in the soil about 40 inches in diameter and 20 inches deep. 2. 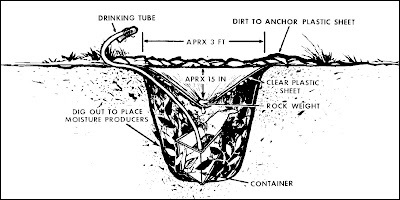 Dig a smaller, deeper sump in the center bottom of the hole to accommodate the container. If polluted waters are to be purified, a small trough can be dug around the side of the hole about halfway down from the top. The trough ensures that the soil wet by the polluted water will be exposed to the sunlight and at the same time that the polluted water is prevented from running into the container. If plant material is used, line the sides of the hole with pieces of plant or its fleshy stems and leaves. Avoid poisonous plants. 3. Place the plastic over the hole and put soil on the edges to hold it in place. Place a rock no larger than a golf ball in the center of the plastic until it is about 15 inches below ground level. The plastic will now have the shape of a cone. 4. Put more soil on the plastic around the rim of the hole to hold the cone securely in place and to prevent water-vapor loss. Straighten the plastic to form a neat cone with an angle of about 30 degrees so the water drops will run down and fall into the container. It takes about 1 hour for the air to become saturated and start condensing on the underside of the plastic cone. If you have a long enough rubber or plastic tubing, you can put on end of the tube into the container and run the other end under the plastic sheet and dirt to act as a straw. By doing this you can access the water in the container without having to continuously lift the plastic to get to the water. Remember to plug the tube when not in use so that the moisture will not evaporate and so that the tube opening stays free of dirt. You will need at least four stills to meet your individual daily water intake needs. 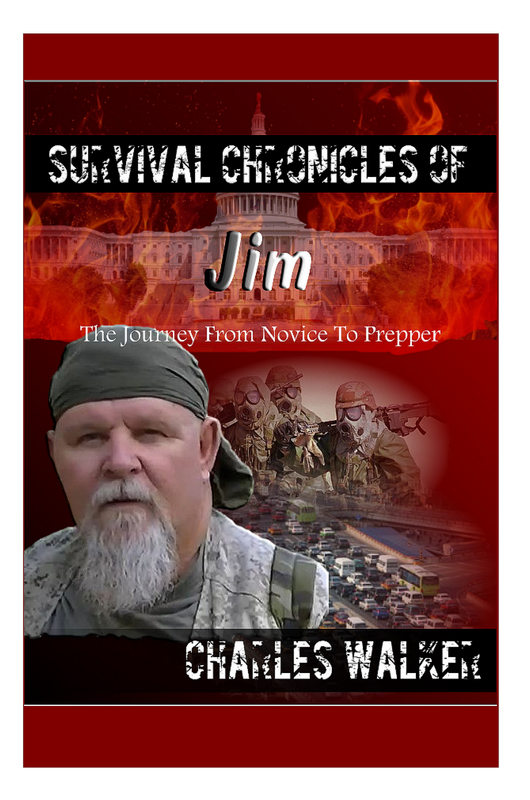 Its usually takes about 6-12 hours to obtain a quarter canteen cup of water and sometimes even longer.